This slang expression, Tu l’as eu dans le baba! (you need an exclamation point), is mainly used to express a failure, or when you expected something you didn’t get. It’s somehow a funny expression, used quite often. 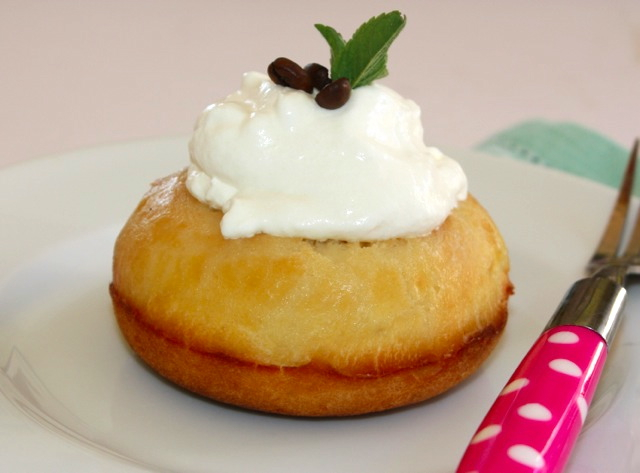 But baba is also a dessert, baba au rhum is a traditional rhum cake served with whipped cream (but you can serve it with fruits also)…and yes there is a little history behind it, because it involves Nancy my hometown. When recipes like this one are traced back 300 or 400 years, sometimes it’s difficult to really be 100% certain where the inspiration or the original recipe originated. It might have been someone who came back from a trip and “imported” the idea or the recipe from a foreign country, then developed it in its own country. 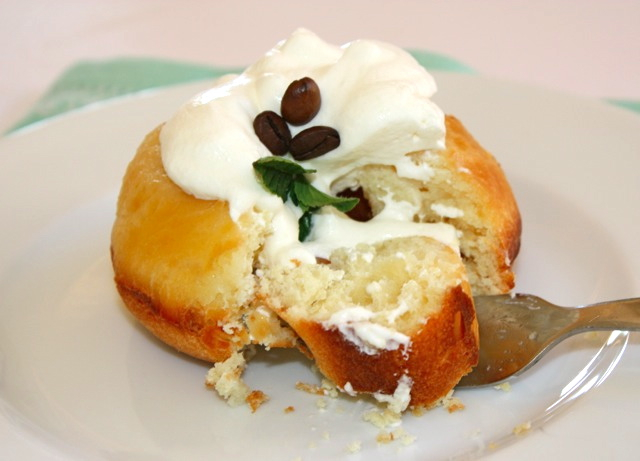 As far as baba au rhum is concerned, it’s linked to King Stanislas Leszczinzky (king of Poland) and also Duke of Lorraine in the XVIIIe, brought back the idea from Poland in his Luneville castle, then the recipe started to evolve a bit over time. This was my first try at baba au rhum, usually pastries are my second choice when I have to eat something, I love to serve a great pastry after a meal when I have guests over, but not being a sweet tooth, I don’t go into some baking spree. Once in a while I like to try out baking new things, but salt is my element not sugar. The recipe has been inspired by the book called “La cuisine des bistrots” from edition “Tomawalk’. Even though baking time said 25 min, I think according to your oven you have to adapt it, and not over cook the baba, or it will get hard and difficult for the rum syrup to soak it. Next time I will decrease baking time. Then of course, you can add quantity of rum you like, it’s all up to your tastes! Dissolve yeast in lukewarm milk and let it rest for 10 min. In a mixing container, mix flour, eggs, sugar and mixture milk/yeast. Mix well until you obtain an elastic batter. Soften butter at room. temperature. Let the batter rest for about one hour in a warm area. After the batter rested, incorporate soft butter and mix until the batter becomes smooth. Butter molds, then divide batter in them, filling them in half. Let it rest for another hour or so. Preheat oven at 390F and cook for about 20-25 minutes. Don’t overcook or the babas will turn hard and difficult to absorb the syrup. When babas are cooked remove from oven and let them cool on a cookie rack. Prepare the syrup, mix water with sugar and bring to a boil for about 15 minutes. Remove from heat and add rum. Place babas in a deep plate and pour 2 tbs of hot syrup. Let the babas absorb the liquid, then proceed a few more times until the babas are well soaked. Place babas in refrigerator until ready to serve. Serve with whipped cream. This entry was posted by silvia on January 21, 2013 at 11:32 pm, and is filed under Desserts. Follow any responses to this post through RSS 2.0.You can leave a response or trackback from your own site. Last time I had baba was in Naples… a long time ago! I might try this—it actually doesn’t sound that hard to make.